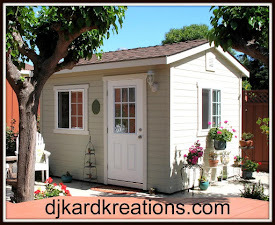 The last domino of February is teetering over and if you look off to the east, you can see the first domino of March on the horizon, slowly making her way to the garden gate. 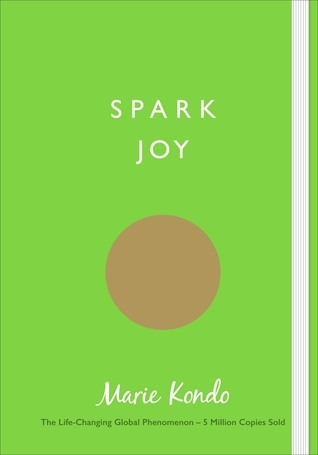 And, boy, is the garden ever happy to see March coming with her galoshes and her tote filled with trowels, gloves, and little flower seedlings. To watercolor these wind-swept flowers, I used Distress Ink markers directly to the stamp, spritzed the ink with a fine mist, and then stamped it on watercolor paper. 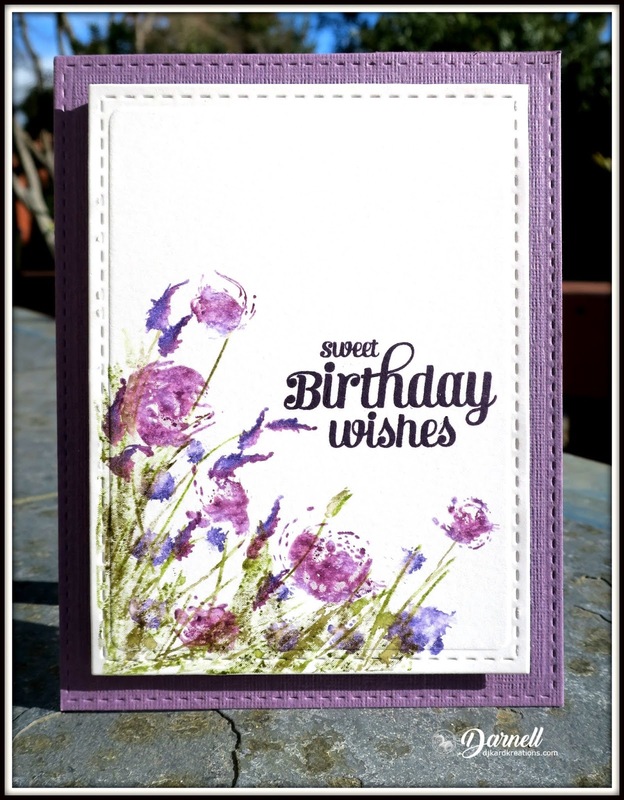 The Rubbernecker stamps used are from the "Wildflowers in the Wind" set. 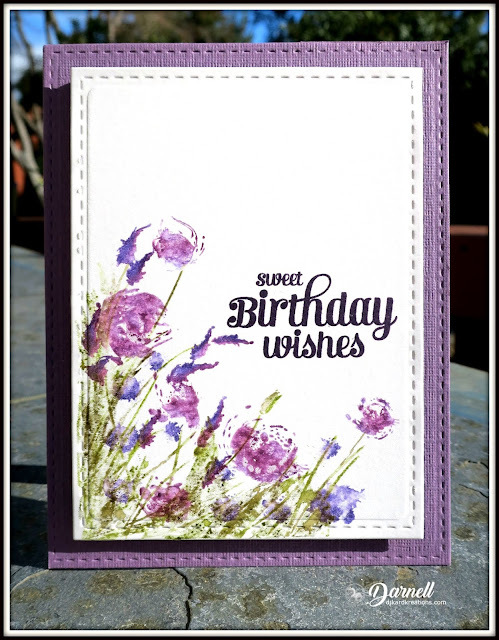 The matching plum card base and the floral panel were stitched with my MFT die and the front panel was popped up with fun foam. AAA Cards: One corner plus optional twist of music. 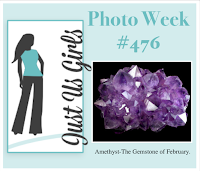 Just Us Girls Photo Week: below. Shopping Our Stash: Celebrating February (purple). I have often shared with you our amazing hardenbergia that blooms every February. We never cease to be amazed at how it grows every year. Now follow me with this. 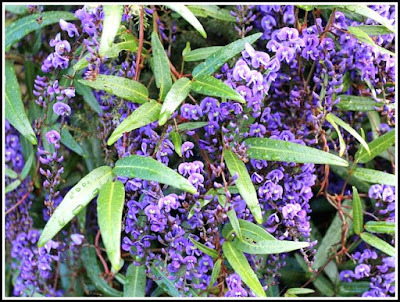 The photo below is from the front yard where the hardenbergia is planted. That entire expanse of purple blooms is coming from ONE plant! It was planted seven or eight years ago. Now check this out below. Here is a closeup of the gorgeous purple flowers. 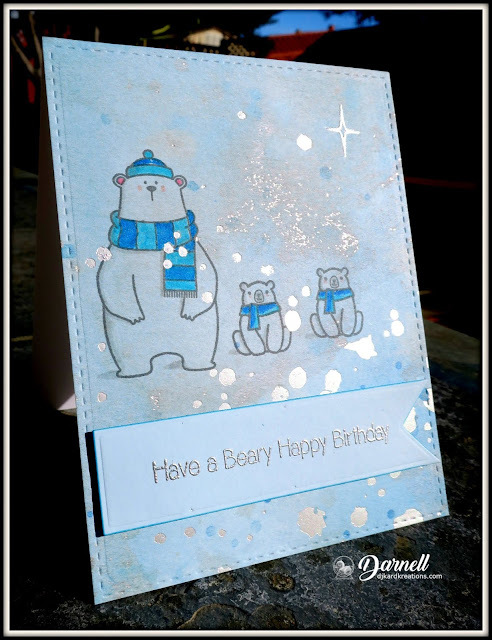 I thought this design would be cute for my peeps with December birthdays. The adult bear and the sediment are from "Cool Day" by MFT. The fishtail banner and stitching are also from MFT. The adult bear is watching her sister's twin babies today. 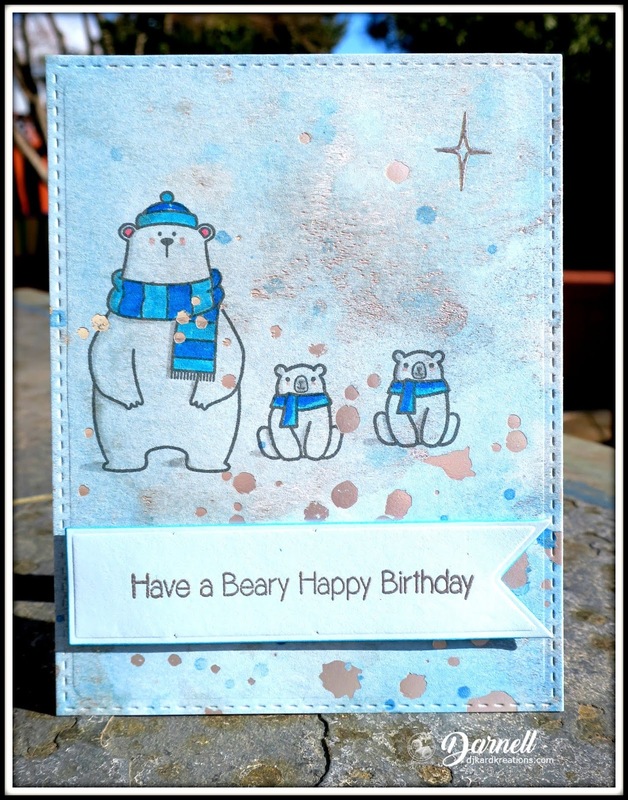 Both they and the north star are NBUS from "Polar Bear Fun" by Poppystamps. Even though they agreed to have their photo taken, some bears just always look shutter-shocked in photos! My cousin LeRoy is like that, too. Christmas Kickstart: Have a very beary Christmas. 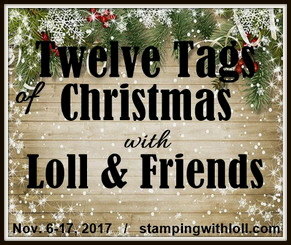 Rudolph Days: Anything goes with Christmas. Oh, dear, that hasn't happened for years. My whole post just went belly up and disappeared. Pfft! And I was all finished. Total operator error, I'm sure, but that doesn't give me any solace, especially since I'm not sure prezackly what I did wrong. Since everything I write is spontaneous, it's weird to start over so we'll just move on as soon as Hammy returns with my wodka. Thank you, buddy. It's hard to get more QACAS than this card with no stamping on it. This lovely friendship text paper (from PTI?) is from my stash. 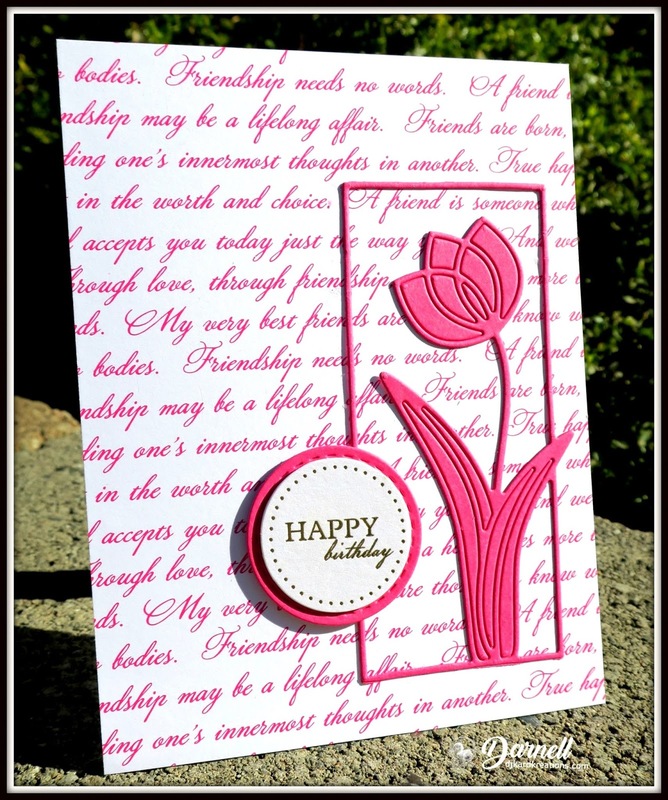 The NBUS die cut called "Sweet Tulip" is from Simon Says Stamp. I'm tickled to say that I haven't had it on Mt. NBUS for two years like usually happens. In fact, it only arrived a few days ago! The sediment is a store-bought button, also ancient and also from my stash. I backed it with a matching stitched circle die cut. 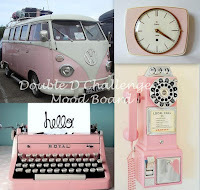 Double D Challenges: Pink and white. 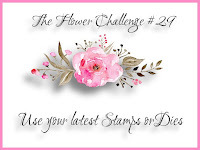 The Flower Challenge: Use your latest stamps or dies. Inkspirational: Text. 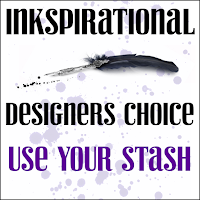 Designer's choice: Use your stash. 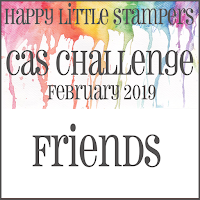 Simon Says Stamp Wednesday Challenge: No stamps allowed. See, now the title of my post makes sense! This card is a reminder of the Best Friends challenge currently going on at Words 2 Craft By (W2CB) where I have the pleasure of being the Guest Designer this month! The NBUS girlfriends and the sediment are from the Art Impressions stamp set called "Laughing." It was a gift from my friend Brenda when I went to visit her last fall. (Thank you, mf!) I paper-pieced and Ziggified the girls and then I masked them in order to brush antique linen Oxi ink through a water drop stencil to make the background. The panel was then inked around the edge and adhered to the card base. I hope you'll be able to make a friendship and/or kindness card and play along this month at W2CB! 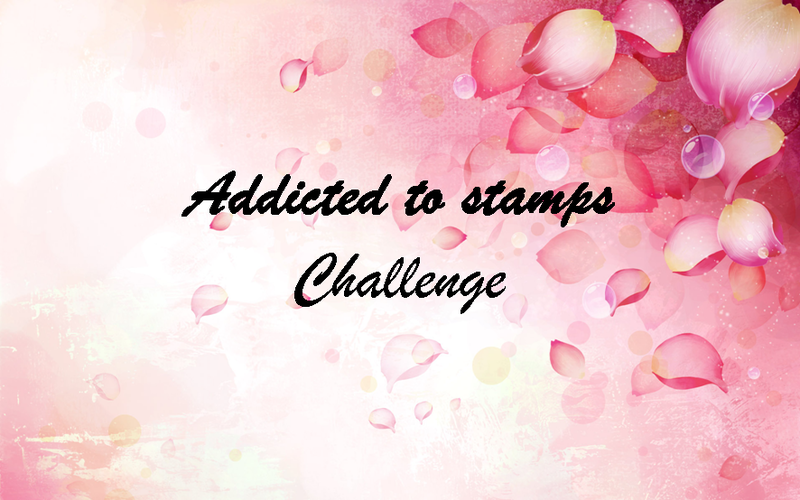 Addicted to Stamps: Anything but a square. 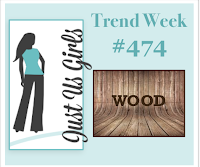 Mod Squad: Brand name clear or rubber stamps. 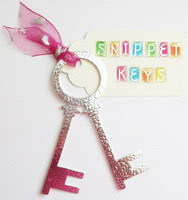 Pixie's Snippets Playground: Anything goes with snippets. Caught this little guy on the fence yesterday. Don't know whose yard the orange came from, but you can't blame him for stealing it. 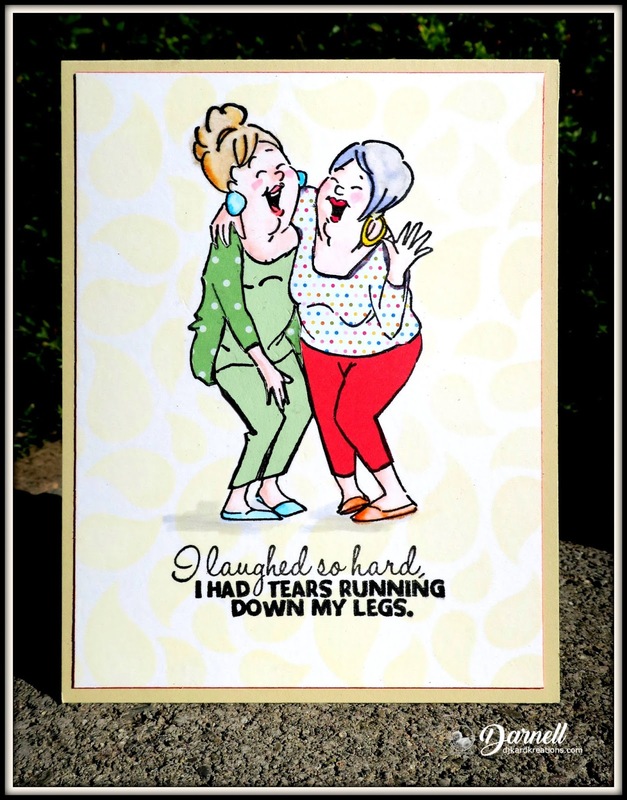 This is, after all, cold and flu season! I'm so nervous about the way this month is whooshing by just like January did. You guys, this has to stop. There are just way too many techniques I still have to try in my nine-inch-wide Techniques to Try binder, not to mention Mt. NBUS, which has now become Mt. NBUS I and II for reasons I'm sure I don't understand, seeing as how I resolved not to let that happen. Where's that rascal hamster?! I knew once I taught him glossification, he would soon finger out how to push that Paypal button! But I digest. Let's move on to Show and Tell. Time's a flying. 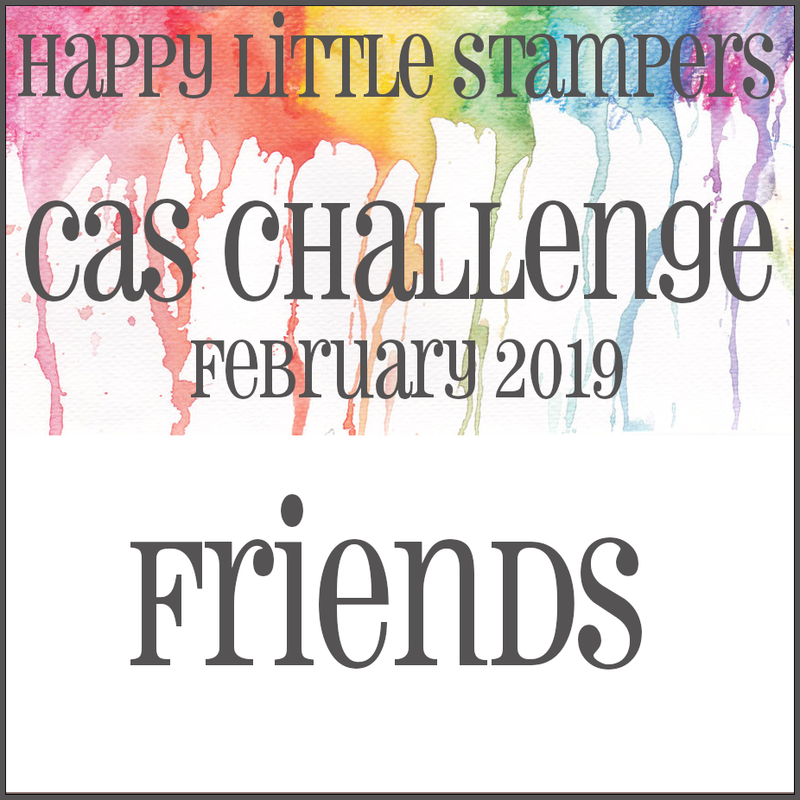 I made this for the CAS Stencil Challenge: Powdered inks. 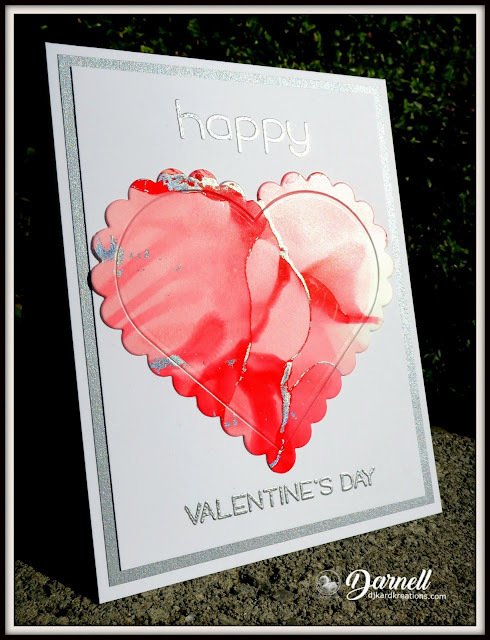 The right side of the piece was created by sprinkling Brushos through the openings of a diamond/argyle stencil, followed by a light spray of water to activate the powdered ink. Using his nose and a nontoxic glue made from flour and water, Hammy ran a thin bead of glue along the seam and I applied a strip of colored card to finish the edge. 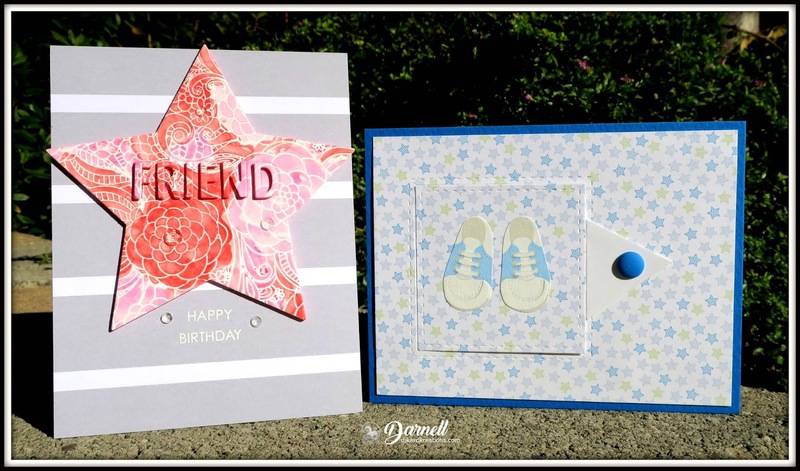 To keep the design clean and simple and to further enhance the movement and the diamond design, the left side was stamped diagonally with a crayon from "Smarty Pants" by Paper Smooches, which was watercoloured with Ziggies. 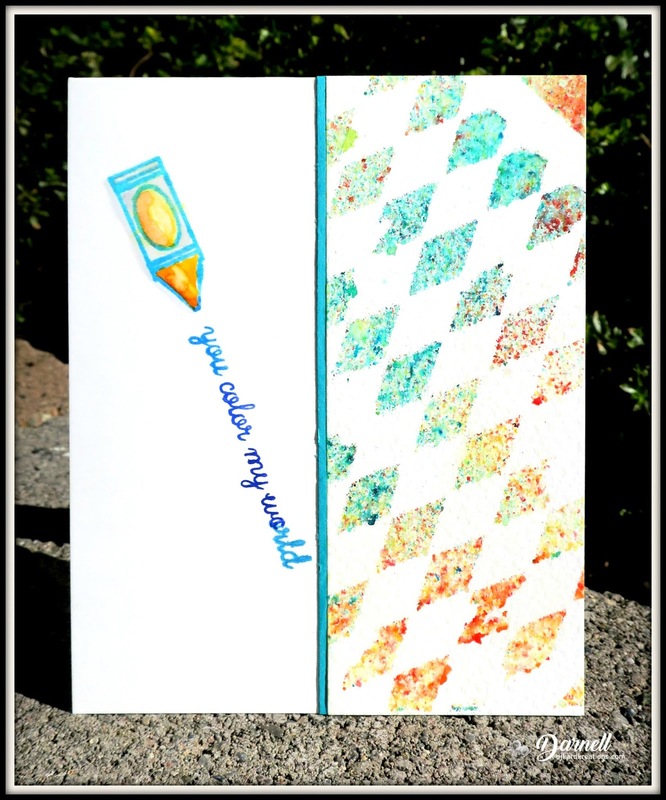 Flowing from the crayon is a sediment from "Worm Wishes" by Reverse Confetti, stamped with a Kaleidicolor ink pad. 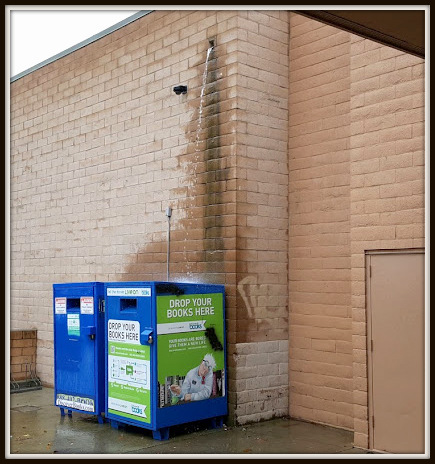 Which magically never runs dry! Yay, a Christmas card! (See opening paragraph!) This design was created by smooching Oxi ink onto the corner of the card and immediately pressing glittery foil over the damp ink with an acrylic block. Harriet and I decided to try this and it was seriously that simple. The PEACE sediment is from Winnie & Walter. 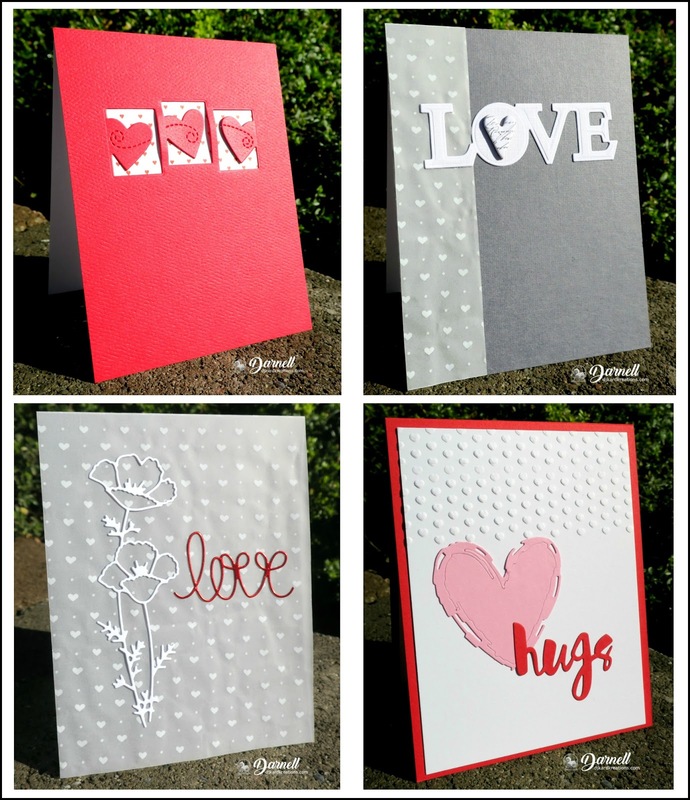 It was cut from fun foam and backed with silver paper. 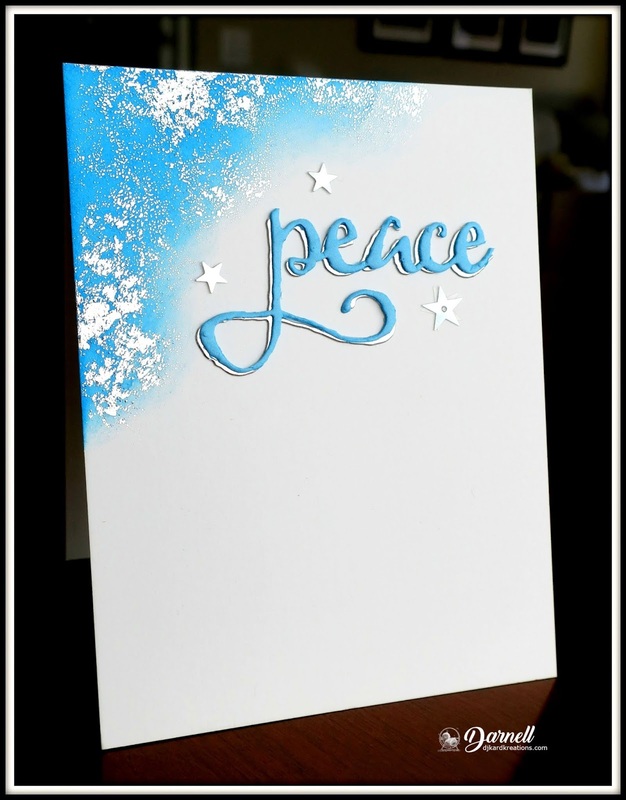 The silver looks white in the light, but the glitter foil, stars, and sediment shadow are all schparkly silver. 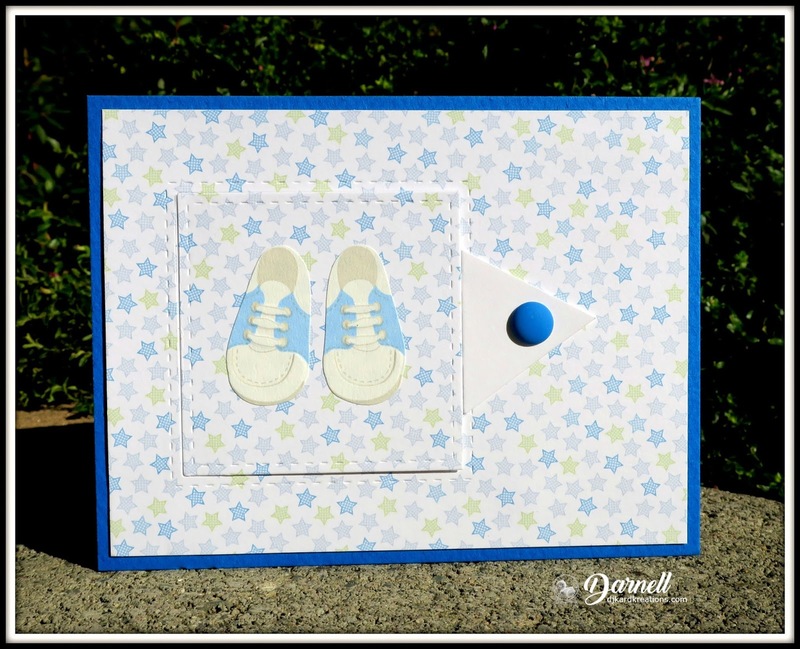 Immediately sprinkle on Sticky Embossing Powder by Ranger. Use your heat gun on the powder until it becomes sticky and shiny. 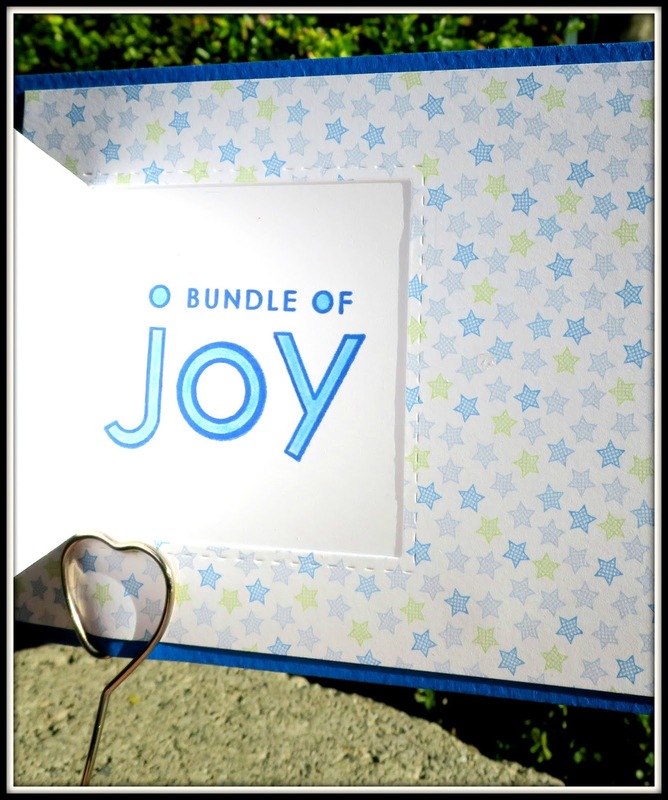 Cover with foil (we used Ranger Hologram foil) and press down using your acrylic block until you get the look you want. 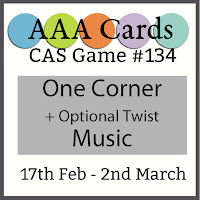 AAA Cards: #134 One corner with the option of Music. 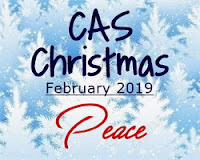 CAS Christmas Card Challenge: Peace. 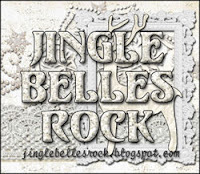 Jingle Belles: All that glitters. 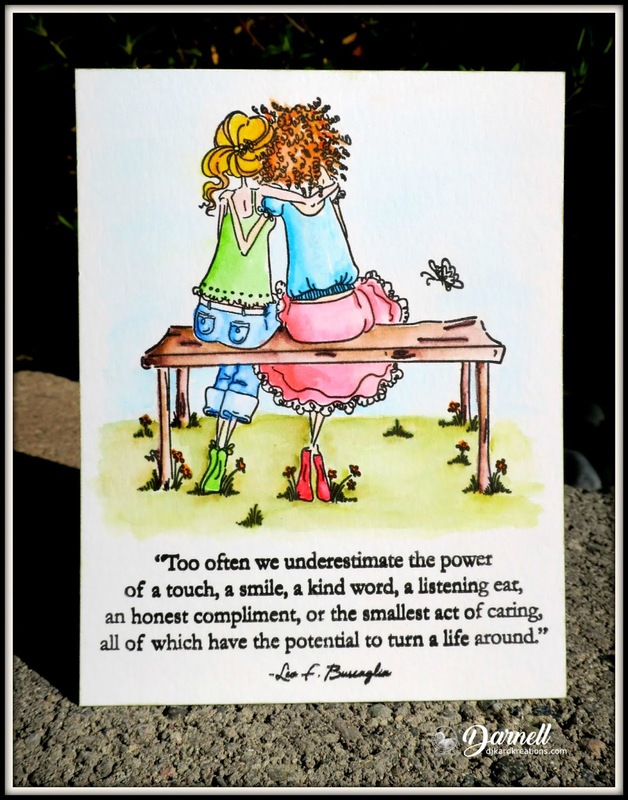 Less Is More: One layer card (OLC), focus on the sentiment. Happy 8th Birthday!! The Stars Come Out for Twofer and CAS WCCC! 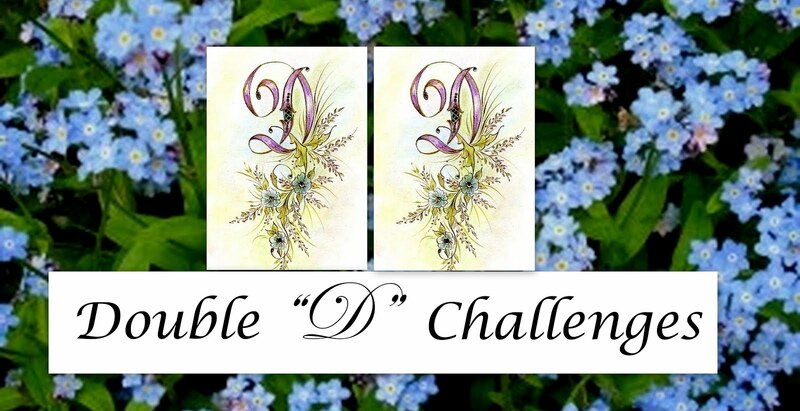 I've made you a coupla reminder challenge cards for the blog today and I thought while I was at it, I'd remind you that you're low on Almond Milk. Oh, wait. I don't think we're sposed to call it that anymore since it's not really milk, you know, from mammals. So please make sure you pick up JOAN (Juice of Almond Nuts) for breakfast tomorrow. 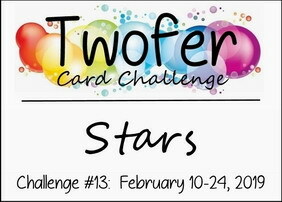 I used a Sizzix large star die on both designs and went unconventional for one of them for the Twofer Card Challenge. Conventional or unconventional, I would so love to see your two designs for two different occasions using the same STAR stamp, die, or stencil over at Twofer Card Challenge #13! You have until the end of day on February 24, 2019 to play. 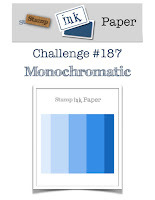 ... you see a cute stamp from Papertrey Ink. Thaz it. QACAS and a little something different. 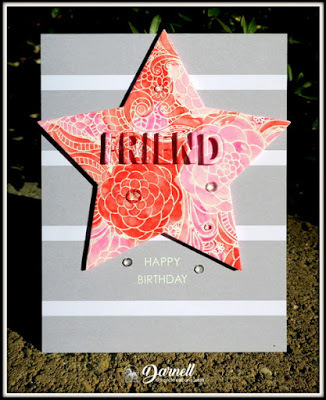 My twofer design uses all the legs of the star die as well as the body, as nature intended. 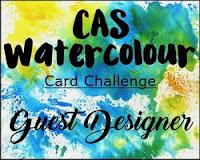 And since this post is also a reminder to you of the ongoing CAS Watercolour Card Challenge, I used red and pink to watercolor the white heat-embossed NBUS stamp from MFT called, "Floral Fantasy Background." I believe the die I used for my hidden letters spelling FRIEND is also from MFT. The striped paper is from my stash and the sediment is from WPlus9's "Birthday Wishes" set. I'd like to thank the entire Design Team at CAS Watercolour Card Challenge for having me as a Guest Designer for February! 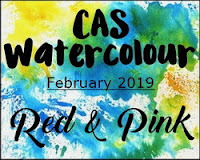 I'm loving all the wonderful red and pink designs in the gallery and I hope you can join in before the challenge closes on February 24th! Retro Rubber: Tic Tac Toe. Middle row across: stripes/birthday/red or pink. Star die more than a year old. Sentiment released April 2016. 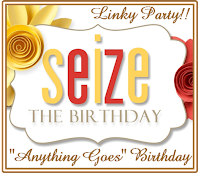 Seize the Birthday: Anything goes #159. 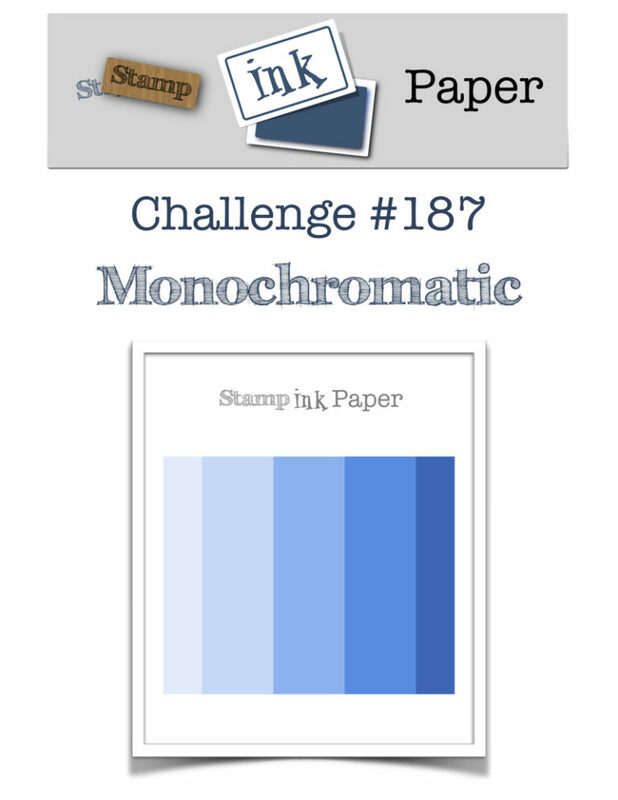 Simon Says Stamp Monday: Typography (play with letters). I find these full frontal background stamps fascinating to heat emboss on colored card, so while I had the Floral Fantasy stamp out, I had fun embossing it in gold, silver, and platinum e/p onto various colored card. 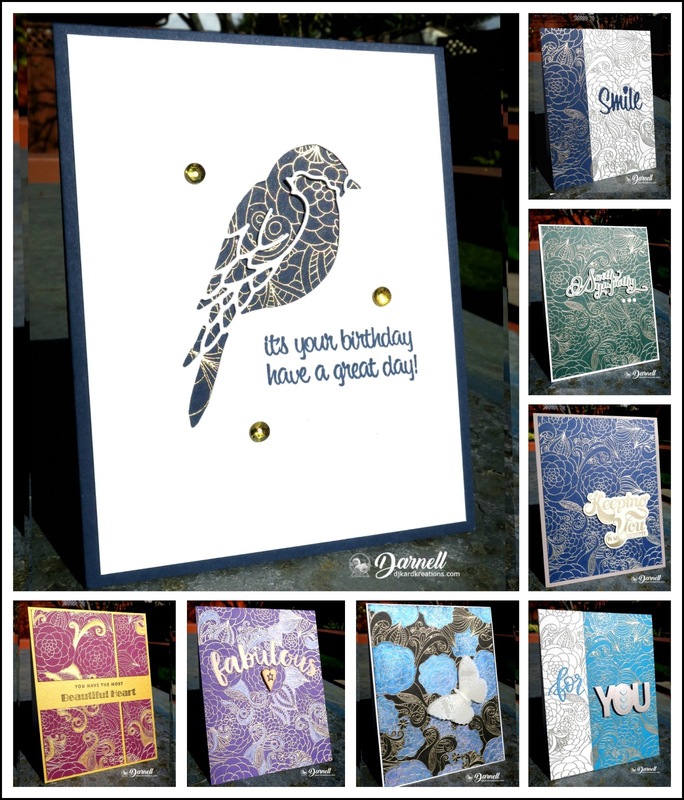 Here's a collage of some of the cards I made from my play. You have to admit, it's very versa tile for coming up with lots of design ideas. I tried to turn each card into the light to show you the magnificent shine. 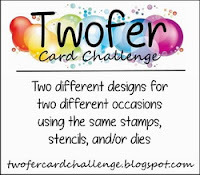 These designs also allowed me to use several NBUS stamps and dies. Whoop!